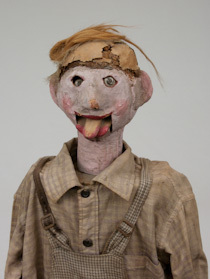 One of our favorite traditional folk art pieces is a ventriloquist's "dummy" who we refer to as "Stevie" because of his likeness to another Steve with a noticeable sweep or comb over. 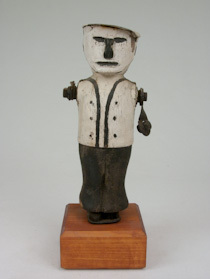 Stevie has a wood and saw dust head with eyes that roll and may be lighted with a battery connection. He is clearly handmade with leather slippers, child's overalls, and shirt. We discovered him in the mid 1980s in an antique store in Bainbridge, Ohio. 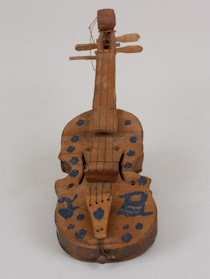 The miniature violin or fiddle was discovered in an antique mall along the Ohio River with a note that it was created by J. L. Burnside. The piece is quite dear with intact strings and the glitter applied initials of the artist. The pair of carvings circa 1930s was originally found in Missouri. They are very detailed and polychromed the man is suited and holds a proper hat. The blond haired woman was holding what we assume to have been a gathering basket which is missing. 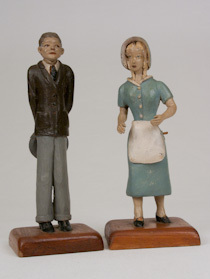 This couple was purchased from a dealer at the annual Folk Art show in Richmond, Indiana in the the late 1990s. The primitive folk art alligator was purchased as an anonymous work during a Kimball Sterling auction in Johnson City, Tennessee in the 90s from the Howard Smith Collection. 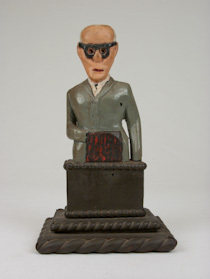 The secret society figure was purchased in the late 1990s at an antique store in Lebanon, Ohio. The piece is signed: Jack Phelps, Jamestown, Kentucky. 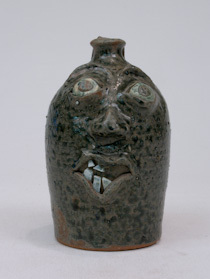 The face jug is not quite grotesque given as a gift to the collection in the 1990s, it is signed: E. J. Flowers, N.C. Mtns. The whirligig figure was purchased at an antique auction outside of Spring Valley, Ohio. Stout and sturdy, the figure is missing the blades which would catch the wind. 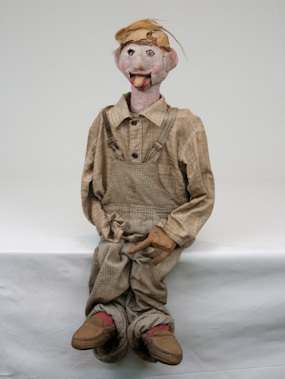 Miscellaneous folk art is comprised of mostly anonymous work that does not necessarily fit in other genres within the collection, no less revered. 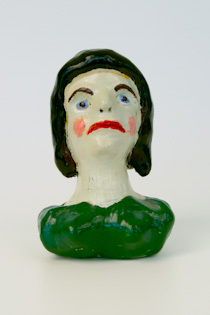 We purchased the ceramic head by Paul Cox in Morehead, Kentucky while the Folk Art Center was still in the beautiful old white house on the Morehead State University campus. 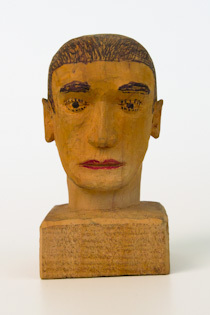 The carved man's head with ink detail unsigned but date 2.28.84 was a gift from a friend who procured it through an estate auction. 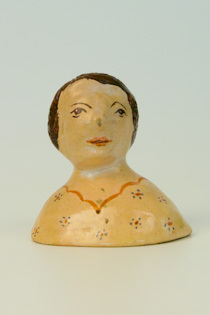 The ceramic bust of a woman was also a gift from a friend who had purchased it at an antique mall with our collection in mind. 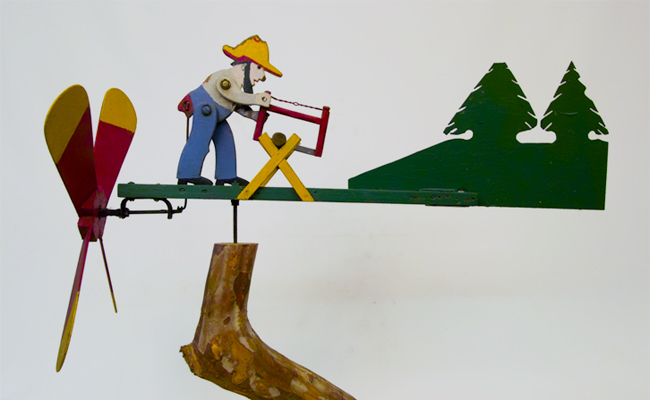 The whirligig which features a man busily sawing wood when the wind catches the vanes was purchased from Art Jones at Art Jones Gallery in Cincinnati, Ohio in the late 1980's. We mounted it on a limb from a Sycamore tree.